With the numbers requiring emergency food aid in the UK doubling in the past six months, there is little to celebrate on World Food Day. 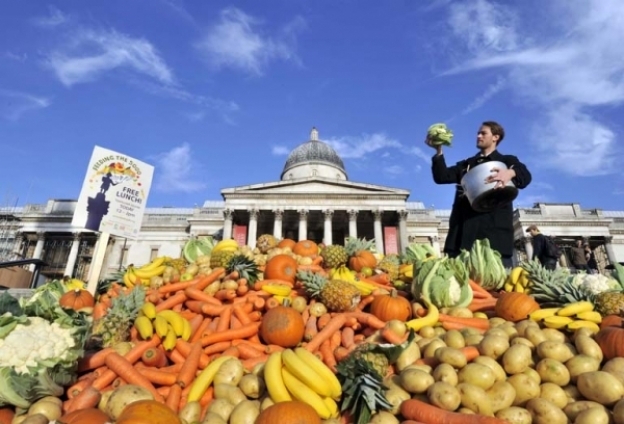 But the question is: Why are so many going hungry when the supermarkets are full of food? As the UK’s food crisis deepens, more people in the UK are turning to church-run foodbanks to cope with the rising cost of living. New foodbanks are being opened by the Trussell Trust at a rate of three a week to meet the demand. The Christian charity, which operates 172 food banks and has a further 91 banks under development nationwide, show that from April to September nearly 110,000 adults and children were referred for emergency help by professionals such as the police, social workers and job centre advisors and GPs. Whilst the exceptionally poor summer is partly to blame for the rise in food prices, others point to deeper underlying causes. Melanie Ward of Action Aid At suggests that a time like this it seems even more nonsensical that we are burning food to make fuel for cars, and that a European Union target is urging our Government to burn even more in future. The World Development Movement argues that banks are earning huge profits from betting on food prices in unregulated financial markets. This creates instability and pushes up global food prices, making poor families around the world go hungry and forcing millions into deeper poverty. New figures out today continue to show the impact the economic crisis is having on the incomes of the poorest – including those in work. Research for the Trust for London shows that one in five people working in London are now being paid poverty wages – with the number of jobs paying below the London living wage up by 100,000 to 580,000 between 2010 and 2011. On top of this, the full impact of austerity and spending cuts have yet to hit. As reported in yesterday’s Guardian, under coalition plans to reduce council tax benefits 2 million low-income workers will face an average bill of £247 a year from April – a charge from which they are currently exempt. With food prices predicted to rise further and incomes of the poorest stagnant or falling the future is bleak. And all this in a still wealthy country, with supermarket shelves heaving with food. Foodbanks may be a short term necessity, but cannot be the long-term solution. If a UK food crisis is to be averted, concerted action is needed to boost the incomes of the poorest and to hold down the escalating cost of food and other essential goods. But what chance of this in an age of austerity? Surely its time to Close the Gap?